BIBVEWADI, PUNE, India — The city of Pune has a new cultural attraction to be proud of – the recently completed Lokshahir Annabhau Sathe Auditorium, an 850-seat facility built to host Marathi-language theatrical productions and other events. 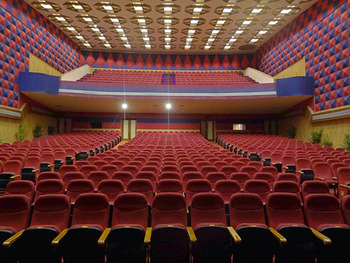 Named for the noted social reformer and writer, the Lokshahir Annabhau Sathe auditorium has an understated yet striking architectural design and an elegant interior with the finest quality appointments and audio/video facilities throughout, including an audio system built around HARMAN Professional’s JBL, Crown and dbx. Lokshahir Annabhau Sathe Auditorium was built under the auspices of government agency Pune Municipal Corporation, which chose Zillion Solutions of Pune as the systems integrator thanks to the firm’s more than 25 years of experience in auditorium installations. “The time span to install the audio system was only five days,” said Pankaj Pansare, Zillion Solutions’ proprietor. “Five days for everything – from receiving the loudspeakers and components to installing, EQing and calibrating the system in time for opening night.” As if that wasn’t enough pressure for Pansare and his team, the installation was the first government project Zillion Solutions had ever undertaken. HARMAN Professional India supplied 12 JBL VRX932LA-1 Constant Curvature loudspeakers, along with two VRX915S subwoofers, two SRX712M stage monitor/utility loudspeakers and 10 Control 1 wall-mountable loudspeakers. The loudspeakers are driven by seven Crown XTi 6002 amplifiers. Additional system components include a dbx DriveRack 4800 Loudspeaker Management System, dbx 234 stereo crossover and dbx 231 dual-31-band equalizer. “We needed a system that provided high-quality sound with even coverage throughout the auditorium, and was easy to operate and be totally reliable once installed,” stated Pansare. The speakers were deployed in a somewhat unusual manner, since no fill loudspeakers were specified for the balcony by the architects. The JBL VRX932LA-1 loudspeakers were placed to cover both the main auditorium floor and the balcony, with the upper line array elements in the cluster aimed at the balcony and operated at a higher volume than the rest of the speakers via the dbx DriveRack 4800. “This combination actually works so well that we don’t miss the presence of fill loudspeakers at all,” Pansare pointed out.